Today is Decoration Day in Liberia, an annual national festival which serves to commemorate departed loved ones. 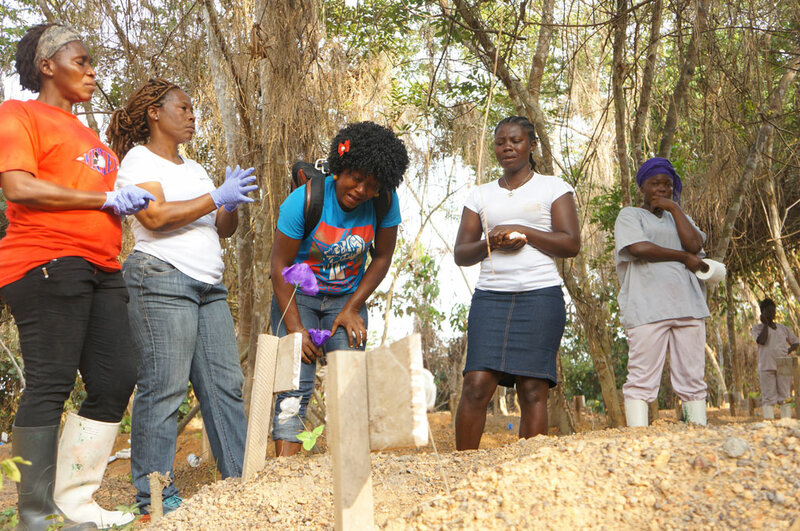 This year Decoration Day has special significance to many as it is the first to be marked since the Ebola crisis. International Medical Corps’ Ebola Treatment Unit in Bong County is playing a part by opening its doors to the friends and families in the community who have lost loved ones to Ebola so they may pay their respects. People began arriving in the early morning to a continuous hum of gospel music that has been enveloping the treatment unit all day from a huge sound system, a steady flow of undulating waves wafting down to the graveyard. Some visitors wanted to spend time by the graveside paying respects quietly while others broke down sobbing loudly. “My mamma, my mamma, she gone forever,” said one lady, Lorpu Kollie, while International Medical Corps’ psychosocial team tried to comfort her. International Medical Corps provided flowers for those who couldn’t afford them, so they could lay them at the gravesides. Other mourners recited prayers, struggling to hold back the tears. “We remember you forever. You always in our hearts,” they said. There are 115 people laid to rest in the Bong County graveyard now. Each person gone, but never forgotten.